Tap to go to the Sort menu. The button displays the current sort mode and direction. Tap to go to the Search and Filters menu. The button displays a sign of the activity of any filters (arc below the magnifying glass icon)and activity of a special mode «Flat View» (FLAT sign above the magnifying glass icon). Shows the current name of the folder, button Back and History button transitions. 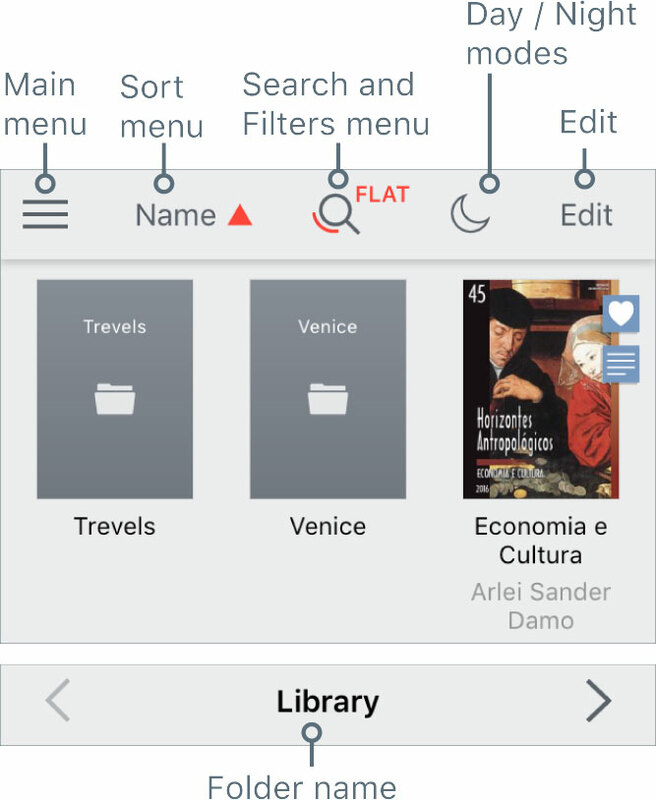 Tap / to select Day / Night modes for App interface and eBooks. Tap the button Edit to go to the Edit mode. Tap Done to return to normal (default) mode. Tap the button to open Bookmarks, Highlights and Notes Panel. It will display a list of document bookmarks (highlights and notes) corresponding to your filters.